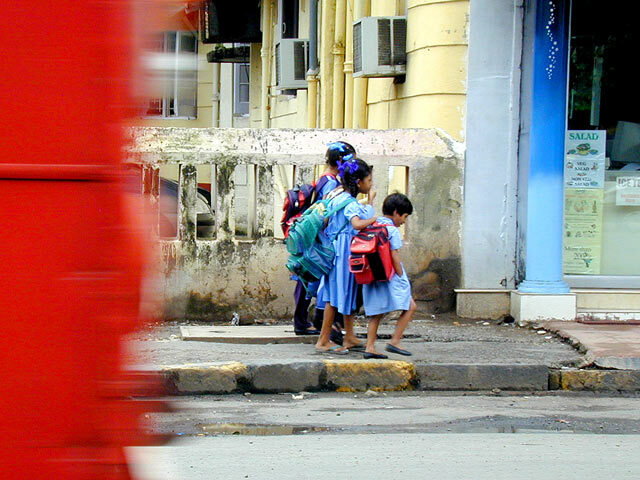 A red bus passes children in uniforms. Transport and integration with the city is key in providing accessibility for all. Photo by Greg Younger. Today is the United Nations’ World Habitat Day – a day established to reflect on the state of our cities and towns, and remind us of our shared responsibility for their stewardship. On this day, UN-HABITAT is releasing the 2013 Global Report on Human Settlements focused on the theme of urban mobility. EMBARQ experts contributed the third chapter of the report. In placing urban mobility at the heart of this year’s release, UN-HABITAT recognizes that accessibility and transportation are essential to the functioning of cities everywhere, and ensuring that their citizens are connected to opportunities. Since the majority of the world’s population now lives in cities, advancing sustainable urban public transport systems has never been more crucial. This challenge is paramount in the developing world, where almost all urban population growth will occur during the next 30 years – the population of cities in developing countries is expected to more than double to nearly 5.2 billion by 2050. EMBARQ is committed to helping cities make sustainable transport a reality through three simple measures: integration, collaboration, and providing high quality service. Effective integration is one of the biggest challenges to implementing successful transport systems worldwide. In order for high-capacity public transport systems like metro or advanced buses to provide the best economic return for the cities, integration must be achieved within the system, with urban form, and with private motorized and non-motorized modes of transport. Integration within a public transport system must occur at three levels: physical, operational, and fare. Physical integration enables direct connections from one service to another – seamless transfers make travel simpler for passengers, thus encouraging greater ridership. Operational integration coordinates schedules and frequencies across the system, ensuring that service is always guaranteed and wait times are reasonable. Fare integration provides free or discounted cost transfers. Integration of a high-capacity public transport system with the built environment is also essential – public transport and urban form should function in harmony. Several cities, including Singapore and Curitiba, Brazil, have successfully implemented efficient public transport services and developed urban forms that greatly encourage public transport ridership. The better a public transport system is woven into the urban landscape, whether through mixed-use or transit-oriented development, the greater the ease for residents to use the system. The final cornerstone of integration is connectivity between public transport and private modes of transport, both motorized and non-motorized. By complementing mass transit systems, these connections accommodate various modes of access to public transport, making it safer and more accessible therefore reducing trips by cars and motorcycles, and the traffic congestion they help generate. Collaboration between institutions at the local, regional, and national levels is particularly vexing in the developing world, where a lack of technical and managerial capacity is often problematic. However, successful peer and benchmarking institutions can serve as useful examples. These include Nova and CoMET, two programs of international railway benchmarking, the International Bus Benchmarking Group (IBBG), a program of urban bus operations benchmarking, and SIBRT, the Latin American Association of Integrated Transport Systems and BRT. These international institutions underscore the important reality that in the field of sustainable transport, an every man for himself attitude won’t get you very far. Networks are key. The exchange of knowledge and ideas between cities and countries is vital for improving the quality of life of urban residents everywhere. Integration and collaboration, although critical components of public transport systems, will only bring cities part of the way towards achieving sustainable urban mobility on the ground. High quality service must provide the foundation upon which public transport systems are built. The quality of a public transport system involves travel time, reliability, safety and security, comfort, and user information – all these must be adequately addressed in order to ensure public acceptance of a transport system. Encouraging more people to switch from private motorized vehicles to trains, buses, bicycles, and sidewalks is the key to unlocking a myriad of benefits: reduced greenhouse gas emissions, better air quality, less traffic congestion, increased road safety, more physical activity, and economic prosperity are all within our grasp. To learn more about UN Habitat and this year’s theme for UN World Habitat Day, see Planning and Design for Sustainable Urban Mobility: Global Report on Human Settlements 2013.